French cartoonists aren’t the only one’s having problems with Islamo-fascists. Cartoonist and anti-Assad activist, Raed Fares is finding it difficult to stay away from the ‘justice’ of thugs when he is in Kafranbel, a town in Syria’s Idlib province. He narrowly survived a shower of bullets on Jan. 28th 2014 after leaving his office around midnight to travel home. His car and the brick wall close by were reportedly riddled with bullets luckily most missed and he survived after being shot twice in the back. Meanwhile, a year later on January 17th 2015 Jabhat al-Nusra (JAN) soldiers behaved like thugs when they occupied the community offices of the Mazaya women’s centre in response to a wild rumour. It’s a training centre for tailors, hairdressers and nurses, which also houses a Free Syria radio station and office for a publication. Workers and activists were beaten and forced to leave and threatened with beheading if any returned. A pregnant woman was beaten and there were fears for the unborn child but thankfully mother and child have stabilised. This cowardly attack was prompted by nothing more than false rumours that the publication of ‘mocking and insulting pictures of the Prophet Mohammad’ was ‘imminent’. So it appears that wild and false rumours are all that is needed to disrupt national coalition processes and have these bullies invade the women’s space, where they were uninvited by the unveiled women and where they then beat them and abused them further calling them whores. These thugs were REALLY ‘mocking and insulting’ their own code. Although real free speech allows for the right to offend, and say what others do not want to hear – in this case in Syria building a united front requires that this not occur just as it requires that atheists have the right to exist and promote their beliefs. Offending each other is not productive and serves the enemy whatever that enemy believes about the after life. JAN occupiers have now withdrawn from the offices and JAN officials have claimed that the incident was unauthorised and that they will rectify this error. 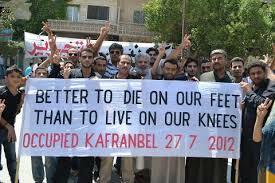 Banners from Kafranbel have consistently caught the attention of English readers since the outbreak of the fighting in Syria now roughly 4 years ago, and with a death toll over 200,000. 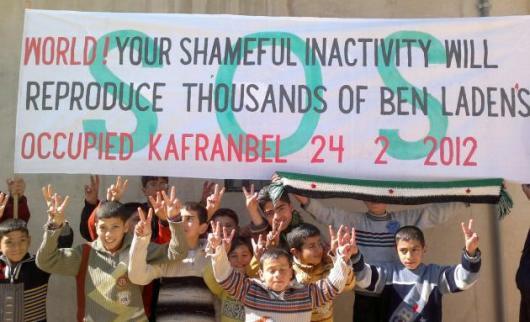 It is difficult to concisely convey messages especially in a second language but the Kafranbel activists have poignantly portrayed the demands and hardships of life in Syria and their humour and courage seems to know no limits. 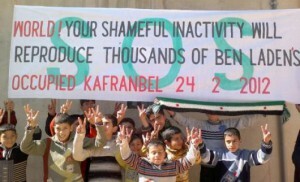 It appears that JAN is the only authority at present in Kafranbel as it was necessary to lodge a complaint against these crimes with JAN itself. 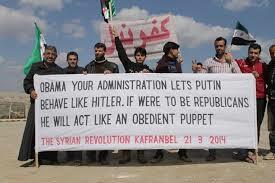 Some examples of messages from Kafranbel.